If a word could describe Missy Mazzoli’s music, it would be captivating. The Brooklyn-based composer, in town this week as composer-in-residence with the Constella Festival, made that clear Tuesday night in Northern Kentucky University’s Digitorium in Highland Heights. Mazzoli, 33, cannot be pigeon-holed. Her music is not precisely eclectic, but more a fusion of diverse influences and elements. She blends rigorous classical training (at the Yale School of Music and with composer Louis Andriessen in The Netherlands) with experience as the leader of her own electro-acoustic band, Victoire. It is not so much what she puts together, but how she does it. You can find rock, minimalism and romanticism in the mix, with imaginative and often exquisite textures, and a wealth of creative concepts. 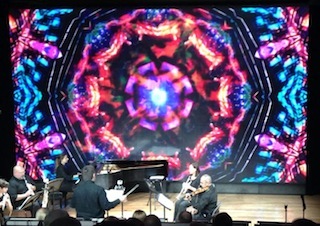 Tuesday’s concert in the Digitorium, with its floor-to-ceiling, digital media wall (285 individual screens, or tiles), provided the opportunity to meld live performance with projections of digital art by Carolina Marini and Joseph Iannopollo. It made for quite a stimulating sensory experience. First up was “Dissolve, O My Heart” (2011), a work for solo violin inspired by the Chaconne from J.S. Bach’s Partita in D Minor. (The title comes from an aria in Bach’s “St. John Passion.”) There was nothing of direct reference beyond the opening chord (an open-fifth) and, as Mazzoli, explained to her listeners, its somewhat conflicted expression -- shall we dance or not? -- reflects her humility in following in Bach’s footsteps. Violinist/Constella artistic director Tatiana Berman put much feeling into it, all against a background of shimmering pinks, reds, oranges and violets on the Digitorium wall. Joanne Wojtowicz tackled “Tooth and Nail” (2010) for amplified viola and pre-recorded electronics next. This ten-minute work, in which the viola plays against its pre-recorded self, was inspired, said Mazzoli, by the jaw harp. Hence, the projections of paper clips onto the wall (a pseudo-image?). Violist Wojtowicz had quite a bit to do, from bounding figures and arpeggios to bits of melody, beginning over a rapid, steady pulse in imitation of the jaw harp . It smoothed out into something quite soulful at the end, making for an overall intriguing effect. “Lies You Can Believe” for string trio (2007) was inspired, Mazzoli said, by her move to New York (she grew up in suburban Philadelphia). (The “lies” refer to what we would call “tall tales,” she said, nothing malicious.) Gypsy music and folk music of the Balkans went into this piece, which she describes as “my own ‘lie,’ an invented and embellished urban folk music.” NKU’s Corbett Trio -- violinist Francisc Restesan, violist Holly Attar and cellist Amy Gillingham -- gave it an energetic reading against a haze of warm colors, fading to black, with an occasional image of a church in the sunset. The instruments went their own way throughout, though a strong repeated motif emerged and was given emphasis at the end. Excerpts from Mazzoli’s chamber opera, “Song from the Uproar” about Swiss adventuress Isabelle Eberhardt (1877-1904) followed. Scored for mezzo-soprano, chamber ensemble and electronica, it has been premiered (at The Kitchen in New York in 2012) and recorded in a 65-minute version, which Mazzoli hopes will become a full-length opera. Heard Tuesday were three movements, performed without visuals by mezzo Anna Little, with flutist Nina Perlove, clarinetist Jeff Carwile, electric guitarist Andrew Winner, bassist Matthew Wiles and pianist Elena Kholodova. “Set That On Fire” was suggested by artist Jean-Michel Basquiat, who began his career as a graffiti artist in New York and was known for his inscription “Build a fort, set that on fire.” Perlove, Carwile and Restesan were joined here by trumpeter Raquel Rodriguez and pianist Ingrid Keller in music that reached an ecstatic climax (the fire) amid rapid, fragmentary passages that occasionally waxed lyrical. The accompanying visuals -- rapidly changing, swelling designs -- were well calculated to match. The NKU New Music Ensemble -- flutist Natalie Schrand, clarinetist Christine Menchen, electric guitarist Colin Weeks, bassist John Herald and pianist Jacob Priddy -- took over for “Magic with Everyday Objects,” which concluded the performance. Though inspired by a “cheesy” book of magic, said Mazzoli, magic “is what musicians do.” She describes it as “a piece on the verge of a nervous breakdown in which the ‘everyday’ objects of music are turned upside down.” Quite simply, there was a lot going on, always over a pounding pulse. It got loud and ugly at one point, there was a hint of the “Dies Irae” at another, and it came to an abrupt and unprepared end. All this was accompanied by radiating designs on the wall behind the players and squishy, waving colors.